On Wednesday night, I led a screenwriting workshop for the Carnegie Mellon University Film Club and wanted to share some of the materials that I brought to the group. The WritersStore.com offers this sample screenplay for spec scripts, or scripts that are written on “speculation” to be sold to a film production company. A shooting script is a version of this script that includes production information (ie. scene numbers) and camera angles. If a person is going to self-produce a screenplay, it’s not strictly necessary to write in spec script format, but I find it’s easier to convey information to collaborators (and also to attract collaborators) if the script is in the standard format. After all, the screenplay is a blueprint for the production that is going to happen and if the starting document is clear then the filming process will benefit. There are a lot of ideas about what makes a film great and no one structure applies to all effective films. However, I find it useful to keep in mind the common ingredients for an effective screenplay. I refer to them when I’m outlining my script and when I’m not sure why the script isn’t working for readers. 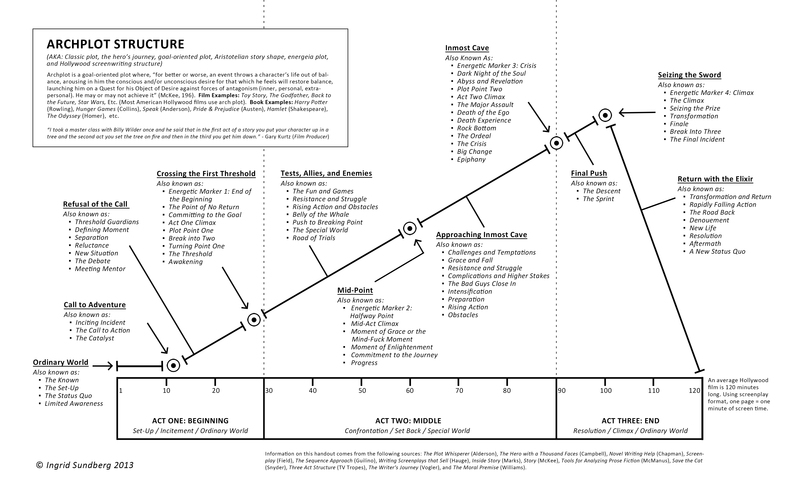 This diagram provides a visual description of the Three-Act Structure featuring the various points that the Hero’s Journey travels in a typical western screenplay. I particularly love this diagram because a lot of resources explain the same elements of the Three-Act Structure using different terms and this diagram blends them all together in one helpful visual. Although controversial, I also included Blake Snyder’s Beat Sheet which offers a page by page breakdown of where elements of many successful screenplays typically appear. This structure doesn’t apply to all great scripts, and critics complain that it makes storytelling too cookie-cutter, but I think this is an extremely helpful tool for writers who have written a script but can’t quite pinpoint why a certain scene isn’t landing with readers or why a certain character isn’t having the impact they want. I also found this calculator that translates the number of pages of your script into the beats so you can use this as a diagnostic tool. Again, these aren’t “rules” that scripts must follow, but they can help diagnose problems that might be hard for a writer who is very close to a script to recognize. The workshop offered a special emphasis on writing for horror, because the CMU Film Club is creating short films with a Halloween theme. I am not a big horror writer–in fact, I’m kind of a chicken when it comes to watching scary movies–but I dug up some helpful information. If the film isn’t scaring you as the writer, then it may not be powerful enough to work on audiences. Horror films and jokes have a lot in common: they have a set-up, they answer a question, and they deliver a punch-line or a twist at the end. Make sure that punch-line lands. Show don’t tell: horror is a visual art. Horror is not always concerned with why or how a monster or metaphysical entity does something, but it’s very concerned with what is happening. Henrik Holmberg offered some helpful tips for writing horror and I found this blog by Chuck Wendig to be very useful. The best way to learn to write horror is to watch other films and read scripts. Compare how The Offering delivers on world-building, suspense, character-building and relationships to how La Boca Del Leon tells its story. Were both films equally surprising? Which elements helped or hindered these stories?